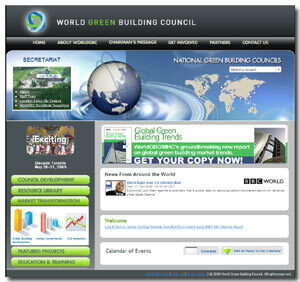 The World Green Building Council is a union of national councils whose mission is to accelerate the transformation of the global built environment towards sustainability. The current membership represents over 50 percent of global construction activity, and touches more than 15,000 companies and organizations worldwide. WorldGBC members are leading the movement that is globalizing environmentally and socially responsible building practices. Its objective is to rapidly build an international coalition that represents the entire global property industry. Buildings and communities are responsible for over 40 per cent of greenhouse gas emissions into the atmosphere. Global awareness of the urgent need to reduce greenhouse gas emissions and other environmental degradation is driving the need for rapid formation of Green Building Councils around the world. Their goal is through leadership collaboration, they hope global construction industry will transform traditional building practices and fully adopt sustainability as the means by which our environments thrive, economies prosper and societies grow to ensure the future health of our planet.